Montenegro There are 4 products. 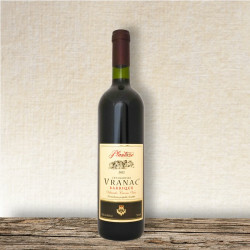 Montenegrin Vranac is a powerful and robust southern wine,made of the autochtonous variety Vranac which had been grown for centuries in Crmnitza,the area stretching from Lake Skadar towards the Adriatic sea,at the altitude of 500 m.
Montenegrin Chardonnay - On the rocky soil of microlocality ‘Milješ’, beside the river or better,lost river Cijevna,running from the Albanian mountains nearby, this old French variety has found all that she likes: poor and rocky soil, lime,water permeable and warm soil.It gives wine of light straw-coloured colour. 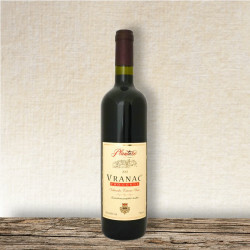 Vranac Pro corde is a premium, dry wine of the controlled origin. 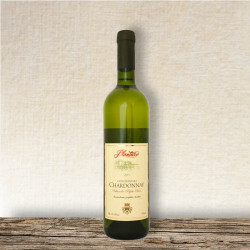 It is unique in the technological process of production which enriches it by the natural way with additional contents of proanthocyanidols and tannins which are natural ingredients of the grapes and which have the power to bind the free radicals, having beneficial effect on the human body. The wine, vintage 2009, the grapes from the best parcels of the Ćemovsko field, picked in the period of full, technological ripeness with the best polyphenolic complex and high sugar contents.